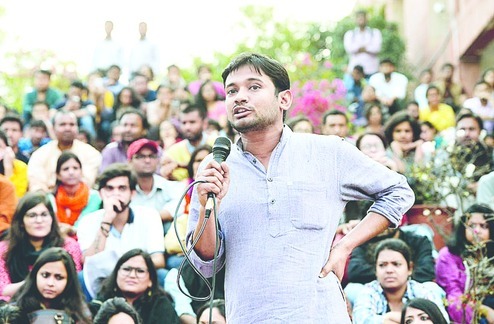 New Delhi: Jawaharlal Nehru University (JNU) students’ union president Kanhaiya Kumar meets Congress vice-president Rahul Gandhi at his residence on Tuesday and thanked him for supporting the varsity students over the ongoing controversy following the February 9 event. After the 9th February controversial event which was organized by the JNU student’s leader Kanhaiya Kumar to mark the martyrdom of parliament terror attack victim Afzal Guru, Rahul Gandhi was one among the other leftist leaders who were present there to support the cause. Together with delegations from the JNU and the All India Students’ Federation (AISF), Kanhaiya met Gandhi at around 11:30 a.m. So a delegation of JNU came here to thank Rahul Gandhi. “In the coming days,we will be meeting other leaders also whoever supported the movement. We will continue this fight to protect the autonomy of the Constitution. We will fight the attempts of the RSS to attack the institutions of prominence in the country,” National Students’ Union of India (NSUI) president Rozi John told the media. He further added that they are not here to do politics of election but they are working under the university and working against the attacks on the educational institutions by the RSS. The Congress vice-president had earlier attended a unity meeting at the JNU to demand Kanhaiya’s release. Gandhi had earlier joined protest march to demand justice for Kanhaiya, attacked on the Centre and PM Narendra Modi accusing them of crushing voices of the youths and students across the nation and pitched for a law to protect them from discrimination and suppression. Rao was under fire for his handling of the suspension of the five Dalit students,among one of them, Rohith Vemula, commits suicide on January 17. The varsity students had affective protested demanding his resignation. Rohit Vemula who was 26-year old, who hanged himself in Hyderabad Central University campus in January, was suspended from his hostel in August last year for allegedly attacking an ABVP leader. Meanwhile, between the protests against Hyderabad University Vice-Chancellor P. Appa Rao, who resumed office today after going on leave amid the storm following the suicide of Dalit research scholar Rohith Vemula, Kanhaiya would be visiting Hyderabad University tomorrow.